ST. JOHN'S, N.L. - Pakistan and suicide bombers may not seem the most likely comic fodder for a vice-regal function, but that didn't stop Lt.-Gov. 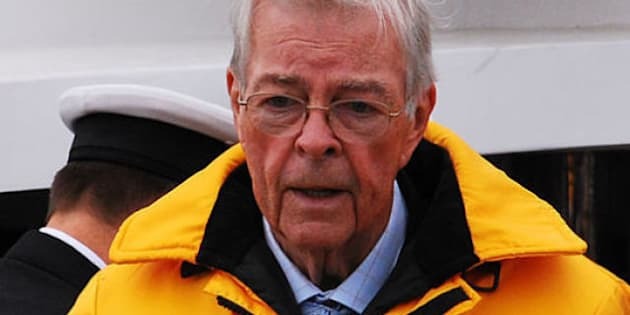 John Crosbie. The Queen's representative in Newfoundland and Labrador — a notoriously quotable former Tory warhorse — said Thursday he's sorry if a joke he made while swearing in cabinet ministers last week offended anyone. It went like this: "This fellow said, 'I was so depressed last night, thinking about the economy, wars, jobs, my savings, social security, retirement funds, etc., I called a suicide hotline and got a call centre in Pakistan. When I told them I was suicidal, they got all excited and asked if I could drive a truck.'" Crosbie got boisterous laughs from the roomful of Progressive Conservative government members at the time. But his opening quip made headlines after the St. John's Telegram reached a Pakistan students group at Memorial University of Newfoundland. Its president told the paper that Crosbie's remarks were a shocking reference to stereotypes. Premier Kathy Dunderdale, when asked to respond, described them in a statement as "clearly inappropriate." Crosbie, a former politician who's known for shooting from the lip, said he was taken aback by the criticism. "Everyone seemed to appreciate the jokes and have a laugh because that's what they were — jokes," he said in an interview. "You can either bore an audience to death, or I try to say something that will keep them listening. These were jokes to do with ... the desperate economic situation the world now faces, particularly in the United States. "However, if some are offended then I would apologize to those offended. They're not racist jokes or anything else, in my opinion." Crosbie, who turned 80 this year, wraps up his five-year term in January 2013. He said he has enjoyed past travels in southern Asia. "But it is a fact, of course, that they've had a lot of difficulty in Pakistan. They're right next door to Afghanistan and the rest of it. But the joke had nothing racist about Pakistan in it. At least, I didn't think so." "Ow," Jonathan Rose, a political scientist at Queen's University in Kingston, Ont., said of Crosbie's attempt at levity. "It would be one thing if he told this even at a dinner party that was closed to the media," he said. "But it's quite another at a very official function like the swearing in of a new cabinet. I think, in that capacity, it's difficult to defend in any way. "I think it's a lapse in judgment, a violation of protocol, an egregious faux pas. But I don't think it's a constitutional crisis. I can't see how he would be recalled or how it would challenge his official capacity." Prime Minister Stephen Harper had to be aware of Crosbie's rhetorical volatility when he appointed him, Rose said. "In choosing John Crosbie, one assumes they understood he has a penchant for, um, pushing the envelope in terms of what's appropriate." Crosbie cheerfully recalled Thursday the most surprising uproar he ever faced for what he thought was a bit of humour. At a Tory fundraising dinner in Victoria in 1990, Crosbie took aim at his Liberal rival Sheila Copps, who at the time was running for her party's leadership. "Pour me another tequila, Sheila, and lay down and love me again," Crosbie sang to the friendly crowd, borrowing from the song "Tequila Sheila," sung by country legend Bobby Bare. Crosbie didn't realize at the time that his performance was caught on camera. "I got off the plane in Ottawa and there was about 100 press out there to quiz the deplorable behaviour of myself." Crosbie had earlier been lambasted by women's groups for telling Copps in 1985 during a Commons debate to "just quiet down, baby." Copps declared that she was "nobody's baby" and asked Crosbie to withdraw the remarks. The pair would play up their squabbles for mutual gain, Crosbie said. "She's a professional politician, and I was as well," he said. "We're good pals now. We're very friendly and she's married to a Newfoundlander, so she's a fine woman as far as I'm concerned." Crosbie said he will tone down his official remarks and strive to be more boring, as he put it. "When I am no longer lieutenant-governor, I intend to speak my mind on any issues I wish, but at the present time I have to be circumspect. "You don't want to be offending people if they're that sensitive."